30 Days CELT English Traing Programme: 30 Days Certificate Course in English Language Teaching for Secondary School Teacher/Teacher Trainers: 30 days English Language Training at Bengulur, The criteria for selection of teachers, facilities available at RIESI and the course details, Thirty day Certificate CELT for Secondary School level Teachers in AP and Telangana, Regional Institute of English, South India, RIESI Bangalore. SCERT Telangana, Rc.No112, Dated:01-09-2017:: Sub: SCERT, Telangana, Hyderabad - Course No.16, 30-days Certificate Course in English Language Teaching for Secondary School Teachers/ Teacher trainers from 12.09.2017 to 11.10.2017 at RIESI Bengaluru. Ref: l.RIESI Bengaluru institute Annual Plan Circular dated 24.05.2017. 2. Lr. No. RIE/TRG/CELT/Sec/AP,TG/KL/2015-16/112 dated 28.08.2017. It is informed to all the District Educational Officers that Regional Institute of English, South India, Jnanabharathi Campus, Bengaluru is going to conduct 30-days Certificate Course in English Language Teaching for SecondarySchool Teachers/Teacher trainers every year. The programme for the year 2017-18 is scheduled from 12.09.2017 to 11.10.2017. One English language teacher is to be identified from each district. The selected teacher's information with full address and contact No: should reach to the O/o SCERT on or before 6-09-2017 . They are expected to take precautions in selection of teachers according to the criteria mentioned below. 30-day training are not eligible. • Should be below the age of SO years. High/ Secondary School Teachers / Teacher Trainers to attend the English Language Training(CELT) Programme at RIESI, Bengulur. 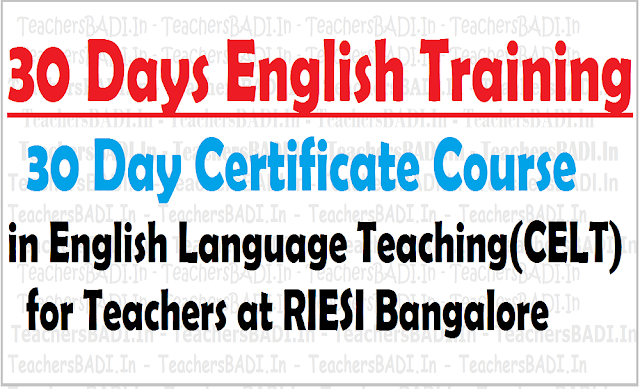 30 day Certificate Course in English Language Teaching for Teachers of High/Secondary School level - Instructions to Teachers Trainees for the CELT course should report at the Regional Institute of English, South India on the morning for course no.10 without fail. They should meet the concerned officer soon after their arrival. The Regional Institute of English South India is functioning on its own premises on Jnanabharathi Campus of the Bangalore University, situated on the Bangalore, Mysore Highway, about 10 Kms, from the centre of the city i.e., City Railway Station or Bus Station (Majestic). You can take one of the buses in the following BTS city bus routes, to reach Jnanabharathi Campus. suitable representation may be given to women's, SC / ST / OBC categories. newly recruited High School Assistant in English may be given preference for undergoing the training. those teachers who have undergone 90-day RIESI training may not he sent. It is a residential course. The participants' accommodation food and other incidental academic charges will be taken care of and adjusted in the stipulatory stipend amount as per the norms. The State department is requested to arrange travel -allowance of participants from the work place to RIESI Bengaluru and back to work place. Duration of the course is 30 days. Course No.11 (See above). Certificates indicating the grade of achievement will be issued. 09:45 AM to 05:00 PM on all working days. HOLIDAYS : The Institute will remain closed on all second and fourth Saturdays and on Karnataka Government holidays. LEAVE :100% attendance is expected. BEDDING: We provide metal cots. We also provide mattresses and pillows and mosquito nets for which a fee of Rs.20/- per day per trainee will be collected. FOOD: Vegetarian food with bed coffee, mid morning / mid evening tea, will be served in the mess. The Institute provides steel plates and tumblers to the trainees. Self-service is the mode of serving. MEDICAL FACILITY : A doctor visits the Institute and is available for consultation twice a week. Trainees will sign for the items of furniture, steel plates and tumblers and other requirement issued to them as soon as they arrive. They will have to pay for any loss or damage. They will not change the rooms without prior permission from the Deputy Warden. Trainees who wish to stay out on any holiday should obtain prior permission from the Coordinator and Deputy Warden.